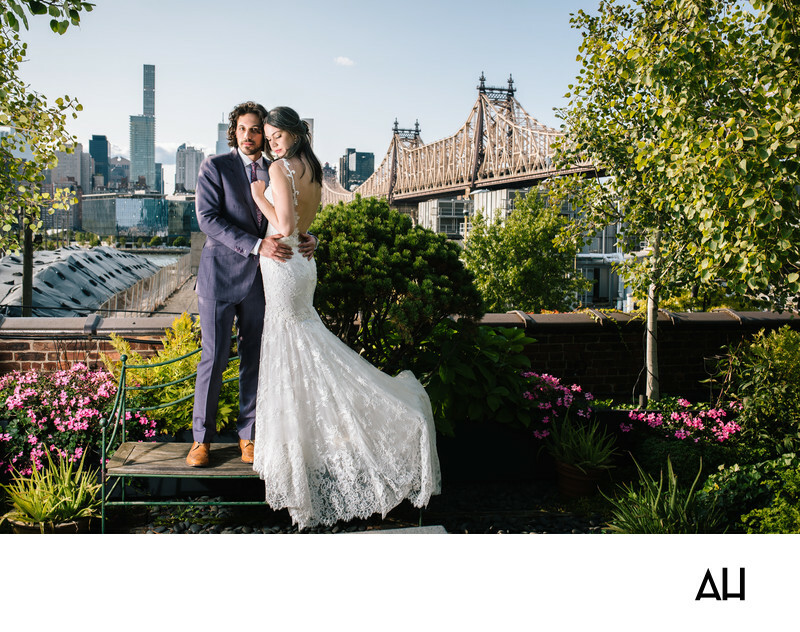 I absolutely love this stunning photo of these clients of mine who recently tied the knot at The Foundry in Long Island city. The groom looked dapper in his grayish blue suite, and the brides’ dress had the most amazingly intricate lace. Long Island City weddings offer guests a chance to see one of Queens most up-and-coming neighborhoods. Long Island City has some of the most art galleries and studios as any neighborhood in New York City. A big portion of it was developed as an industrial area in the 1800’s, and it wasn’t until 2001 that it was rezoned for residential development. A few notable buildings in the area, including the Long Island City Courthouse Complex are on the National Register of Historic Places. Most of the factories are gone now, but LIC does still have the distinction of having the largest U.S. fortune cookie company where four million cookies are produced by Wonton Foods each day. JetBlue has headquarters offices in LIC, and Brooks Brothers still manufactures ties in the neighborhood. More recently the area has seen a burgeoning of waterfront parks, art galleries, studios, and other community developments that signal gentrification in full force. Couples interested in getting married in Long Island City have numerous options. The Foundry is one of the most popular, and they have a newer venue called the Albra room. Paper Factory Hotel features lovely, hip spaces, and of course there are multiple traditional ballrooms, like the Vista Penthouse ballroom located within the Four Points by Sheraton. If you’re considering having a Long Island City wedding, know that you will have plenty of venue options to choose from.